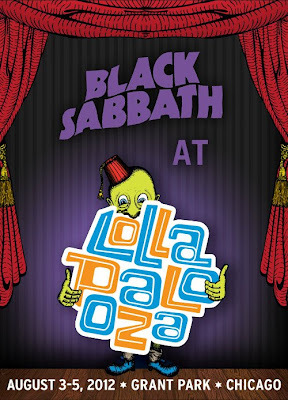 The 2012 Lollapalooza lineup is to be announced today, and Black Sabbath have confirmed that they will headline this year’s event. The Chicago Tribune also reports the UK legends will appear at the August 3-5 event in the city’s Grant Park. The Chicago gig marks the lone North American date for the Sabbath reunion tour, which was shut down following news of guitarist Tony Iommi’s battle with cancer. Sabbath have previously confirmed their June 10th show at the UK’s Download festival will proceed as scheduled. Whether or not it is a full Black Sabbath reunion remains to be seen: drummer Bill Ward went public earlier this year with word that he has threatened to quit the project – which also includes a new album produced by Rick Rubin - over a contract dispute. It was the decision by Lollapalooza organizers 15 years ago to deny Ozzya spot on the bill that led him and Sharon to launch Ozzfest.